Of course I had to do our own haha. Shameless plug: www.yanbirog.com for my creative portfolio hehe. 4 cards, 5x7 in. The hardest thing about this is actually doing the map because it involves illustrating and scaling. Printing: c/o my father-in-law because they have a print shop yeyyy! I wanted to get kraft envelopes talaga but there seems to be none in the market! National Bookstore has brown baronial envelopes but the flaps are trapezoid, I want triangle flaps HAHA. So yeah no choice but to make our own! The materials are SOOOO CHEAP it was really the labor (of love) that racked up the value of these envelopes haha. So please guys if you received one... I hope you think it's pretty. Then, you can throw it away lol. There are kraft cartolinas at National Bookstore that cost around ₱8/pc. You can make 5 standard A7 envelopes with them. BUT we've searched some more and found kraft paper being sold at Prestige Paper. They're not on the shelves and are used to wrap packages but the staff offered it to us because we couldn't seem to find what we're looking for. It's local quality recycled paper. It's the same paper used in regular brown envelopes. WHICH IS DEYM PERFECT. Kraft cartolina is too hard and too brown. Prestige Paper's paper (haha) is just right. Peso power? ₱6/sheet. One sheet can make 12 envelopes are you kidding me?! Prestige Paper is located at the back of Fisher Mall in Quezon City. Another major labor of love! We weren't able to use them 'cos we got convinced that it's bad for barong, but oh well! Fake flowers and leaves are from Cherry Berry in Divisoria. 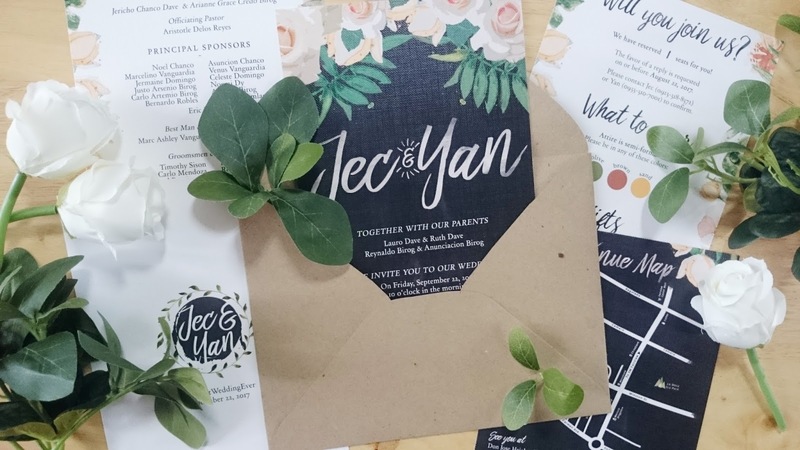 Jute strings, floral tapes, and pins are from Tabora St. and Anding's (around Divi). Para maiba, we didn't opt for the basket of flowers for our flower girls. Instead we made these 2 flower balls. Tools: 7in Styro balls, mini flowers, dress pins, ribbons. All of the tools were bought from Divisoria, except for the useless tools. The mini flowers cost ₱2/pc, we were advised to get 100 pcs per ball so we got 200pcs. In the end we weren't able to use everything, I think we still got around 100 pcs left haha. 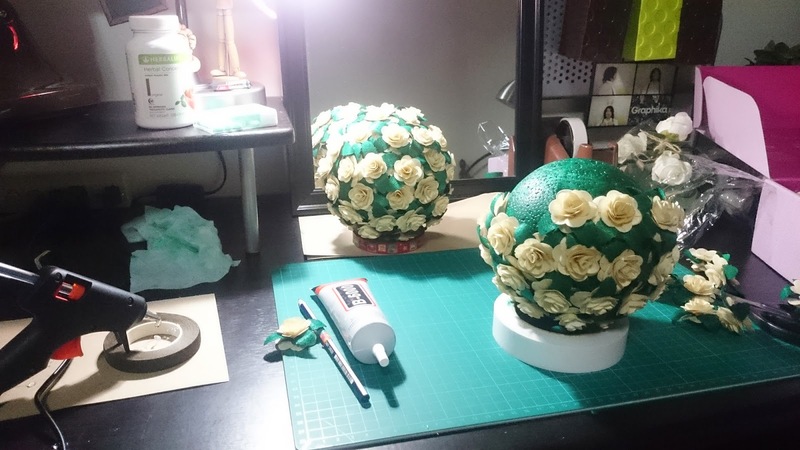 The plan was to cover the ball in green paint before sticking the flowers with glue gun para hindi pangit if may gap. BUT HOLY MOLEY the ball turned out very sticky even after the paint dried. It was kindof useless too in the end because there were no gaps when I finished the project. So much for dirtying my fingersss! 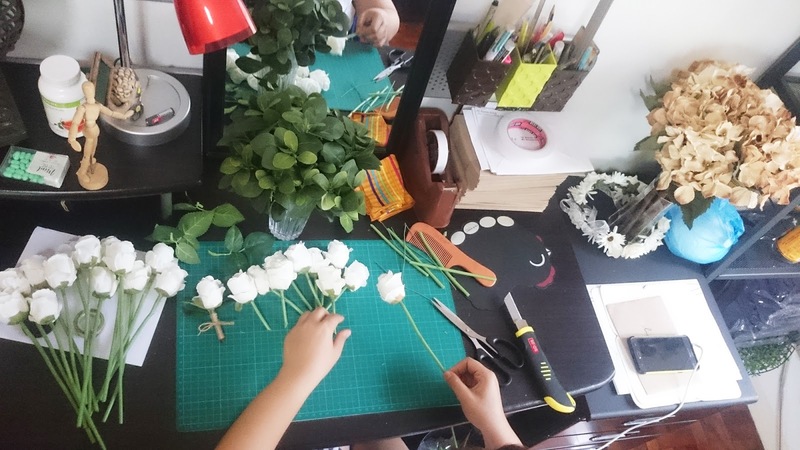 ALSO, if you buy flowers like that I suggest you PIN THEM instead of glue-gunning (???) them. I REALIZED THIS TOO LATE haha. 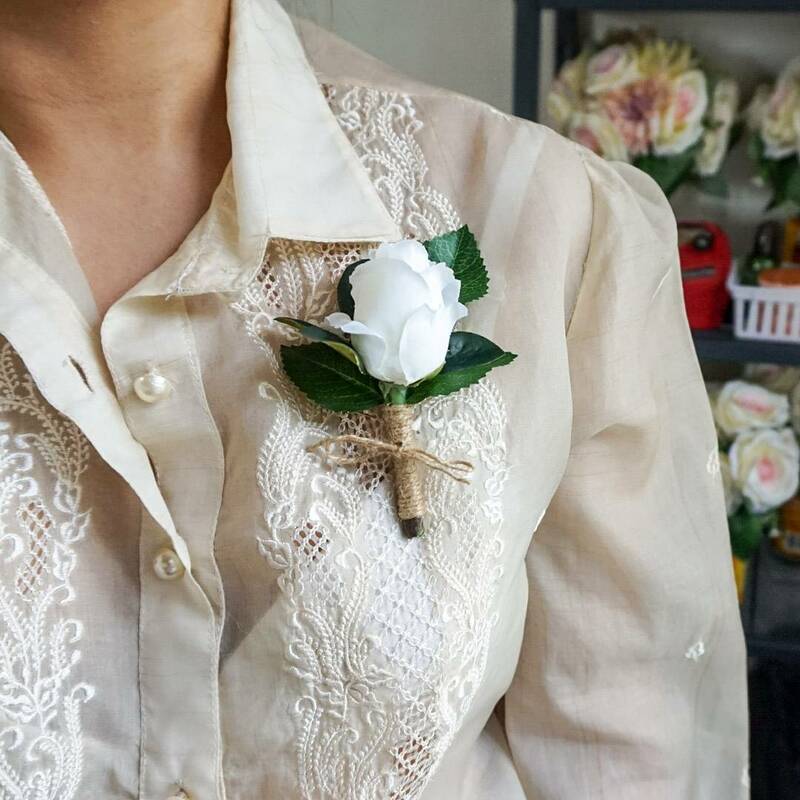 You can pin the center of the flower with a dressmaker pin. Imagine my grief when I learned about this. Since our photo and video package didn't include a guestbook, I decided to make our own. With less than a week left for our wedding, I didn't have enough time to order a custom Photobook huhu. So yeah, ano pa nga ba. For this project I wanted to get a small sketchpad that's not springed para hindi mukang scrapbook haha, stick some photos inside, and wrap it with kraft paper or whatever haha. Thank God I found Abbey Sy's My Lettering Progress Keeper at National Bookstore. 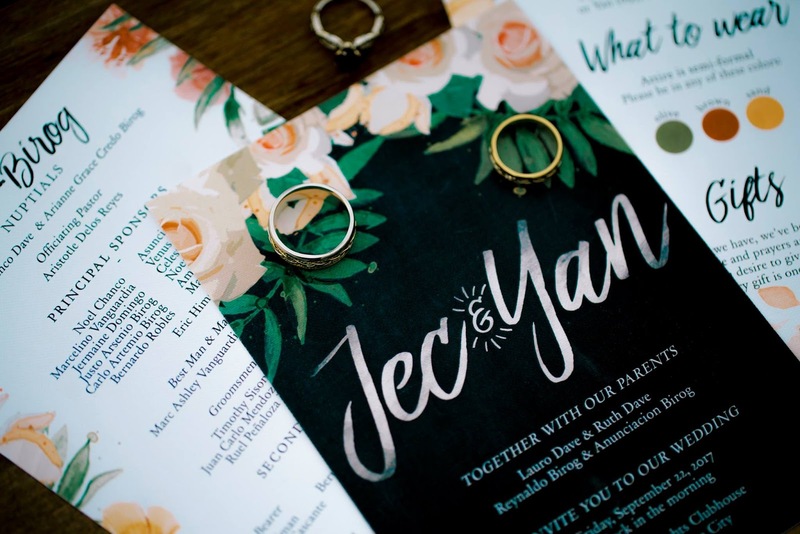 It's the perfect sketchpad for this DIY! It's not springed, the paper is artist grade watercolor paper from Canson (doesn't really matter, just wanted to spell out the specs haha), it's in the perfect size (7x10in), and it has 25 pages only! Just about right considering I don't have a lot of photos haha and duuuh guestbooks aren't usually thick diba haha, like.. who needs all that space. At best, people are just gonna write congratulations and best wishes over and over HAHA. I really just wanted something they can look at and pass around lololol. Anyway. I had our prenup photos printed in 4R size at Tronix. I was worried that the prints would come out too glossy but thank God they use Satin paper, which is like half linen and half glossy, basta. Maganda naman sya. ₱7/photo. For the cover, I took inspiration from pinterest and made a heart shaped collage of our photos. I also designed the cover and had it printed in A4 size for ₱30, still at Tronix. Then I used that to wrap the sketchpad. Ang hassle magbalot jsklrd HAHA. The paper, as I mentioned was Satin, so it was sticky and kinda not waterproof hahaha. Sobrang ingat ako madumihan yung papel! But yeah, I pushed through HAHA. And voila! Our guestbook is doooone! <3 Now that the wedding's over, we're peeling out the yellowing photos and turning the book back into its original form, a sketchpad! Because I didn't want the screen to be blank all the time, I made a loop video for display purposes. Also to remind the guests of our wedding hashtag #DAVEstWeddingEver haha. I actually love it! I can't believe how easy this was to do. I had to learn the basics of Adobe Premiere Pro but basically all I wanted was to put some text with a video background - which I got from Youtube. Just search for "HD background video loop", take your pick, and get it using your favorite illegal downloader (char). Aaaaand that's about it! Thanks for reading all the way, awardddd!